Just to keep you up to date, I have almost finished making up new stock from photographs taken at Clacton Bus Rally and Lewes Bus Rally. We have added several new bus and coach companies to our range as well as some rather lovely additions to our London Transport products. Don’t forget, it’s not just vintage vehicles that we have, we also feature many in current service. Do come and see us on the stand, we may have your favourite bus or coach from either, or both, of these events. We’d love to talk to you – Geoff can talk buses for England (and Scotland, Ireland and Wales)! Me, I’m still learning. Right, back to work on the photos. Tomorrow sees Junction Ten taking a step into the dark. 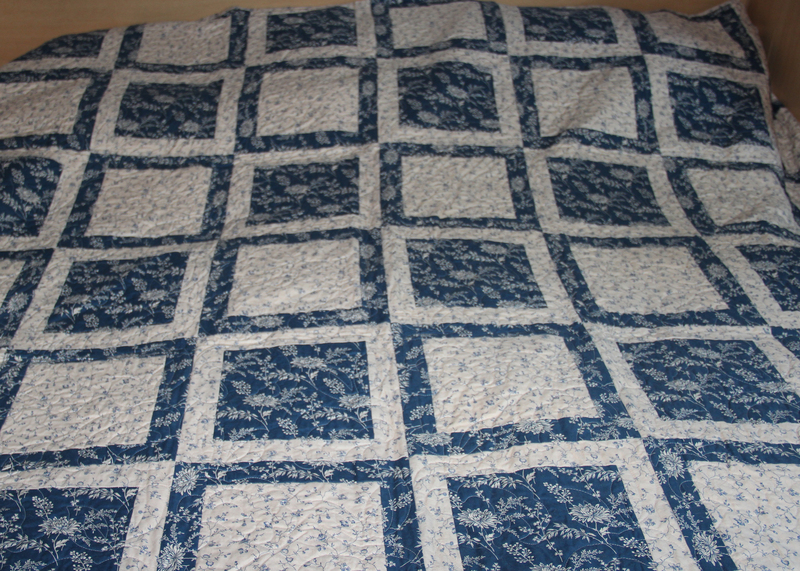 For many years I have made patchwork quilts and knitted garments. I cannot sit still and do absolutely nothing, the creative juices flow and the ideas have to bear fruit. Even when I’m making up the magnets etc., I’m designing the next quilt or pair of socks in my head. To this end, I think it’s time that the world saw my work and also that of my friend, Jacqueline Thompson, a very skilled needlewoman. 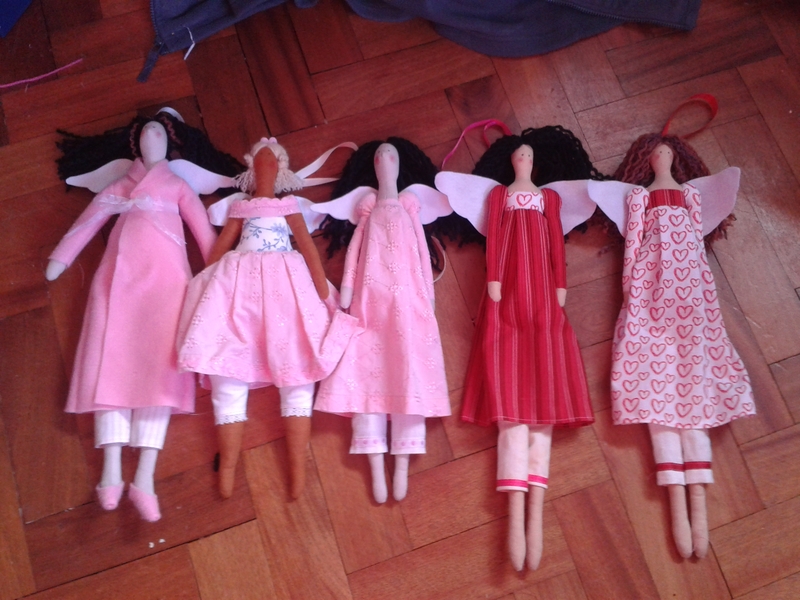 At the fair tomorrow we will have on sale some of Jacqueline’s ‘Ornamental Angels’ alongside some of my knitwear plus some sample patchwork quilts. 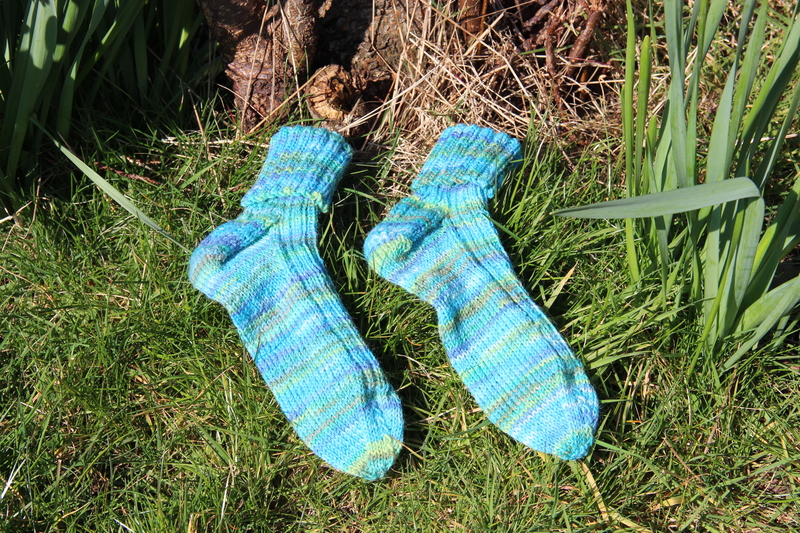 If these meet with approval on line or in the flesh so to speak, I will be offering them for sale through the shop. 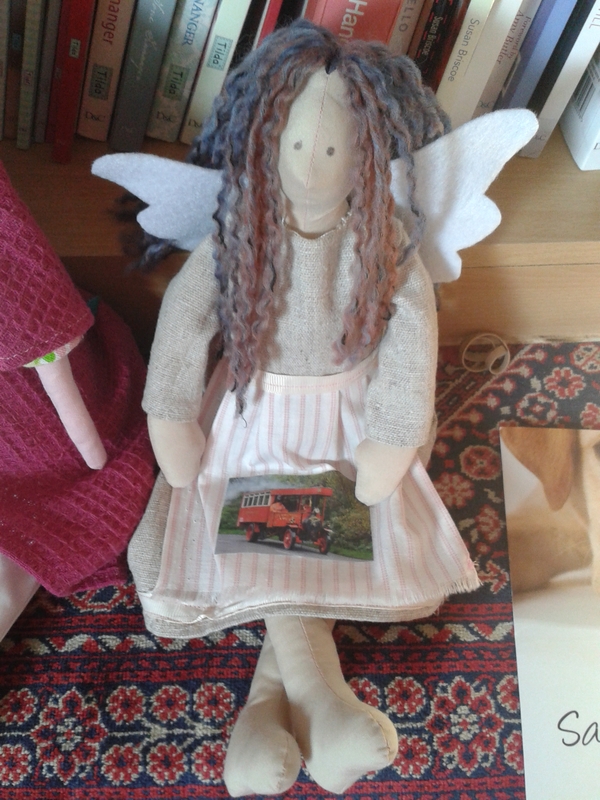 And this is Junction Ten’s very own ‘Transport Angel’. If you are able, please come along and have a look. If not, keep an eye out for further postings. 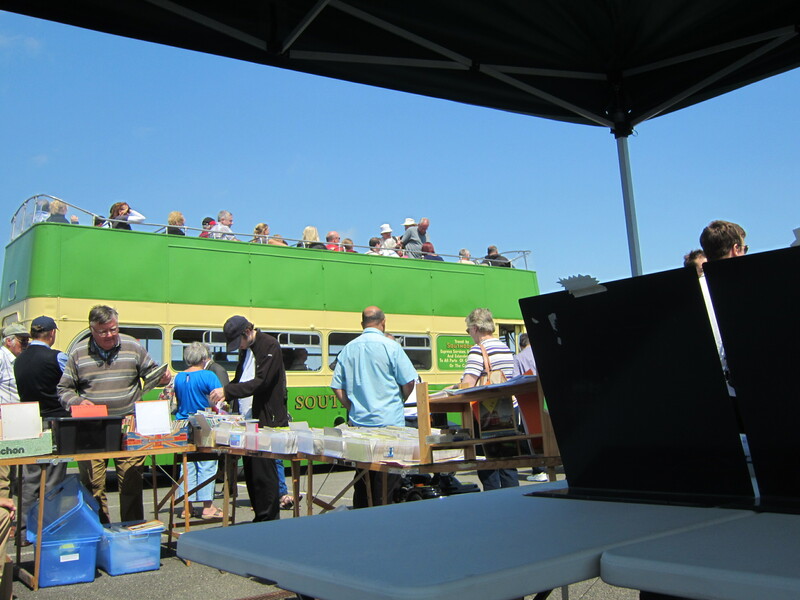 The weather was certainly kind to us as we set up our gazebo and sales stand at the Lewes Bus Rally. The previous day had seen heavy, localised rain and we fully expected to find a waterlogged field on which to erect the gazebo but no, the sun had dried things out, the river was bubbling along in its bed and there were no muddy puddles to catch us out. Being in deepest Sussex it is no wonder that a predominance of Southdown vehicles would rule the day. Several examples of their Leyland PD3 ‘Queen Mary’ double deckers were operating throughout the event taking visitors on tours of the town and various other places. The Queen Marys were Southdown’s workhorses during the sixties and early seventies. The full fronted Northern Counties bodies gave them a unique appearance and gave rise to their being referred to as Southdown’s ‘Routemaster’. As they were operated on coastal routes many were built as convertible open top vehicles for the tourist trade in the summer season. There is something very special about riding on the top deck of an open top Queen Mary with the wind in your hair. For us, Lewes’s major attraction is the Harvey’s Brewery home of our favourite tipple but, today, imbibing a pint in a local hostelry was not to be. Thankfully, our enjoyment of the rally curbed our frustration of trading within sniffing distance of the brewery. Our joy was also compounded when Dennis Jason, owner of RT1777 which is preserved as a training bus, returned from a trip into town with a couple of bottles from the brewery shop. 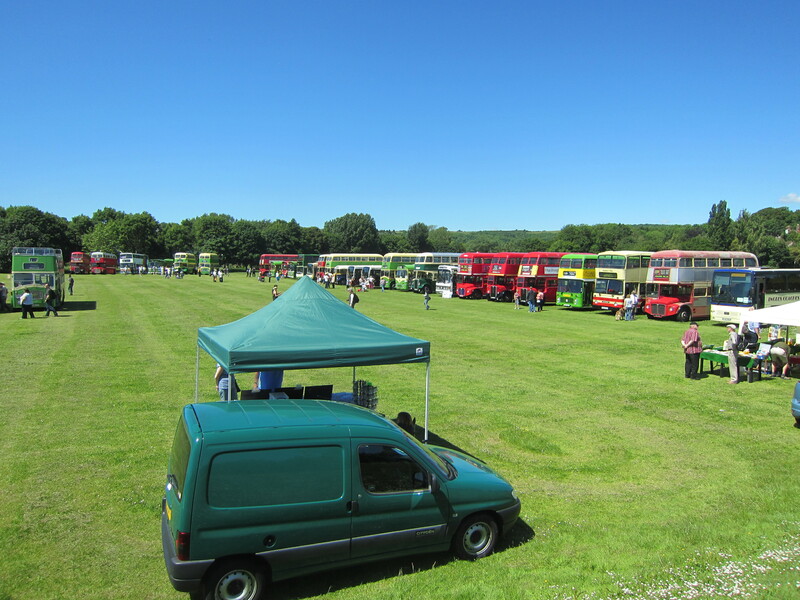 There were several other bus operators in attendance and to name a few: Trent, Compass Bus, Maidstone & District, Brighton & Hove, Eastbourne and London Transport. Our thanks to the organisers for a well run day. We enjoyed it and will be back next time if you’ll have us. 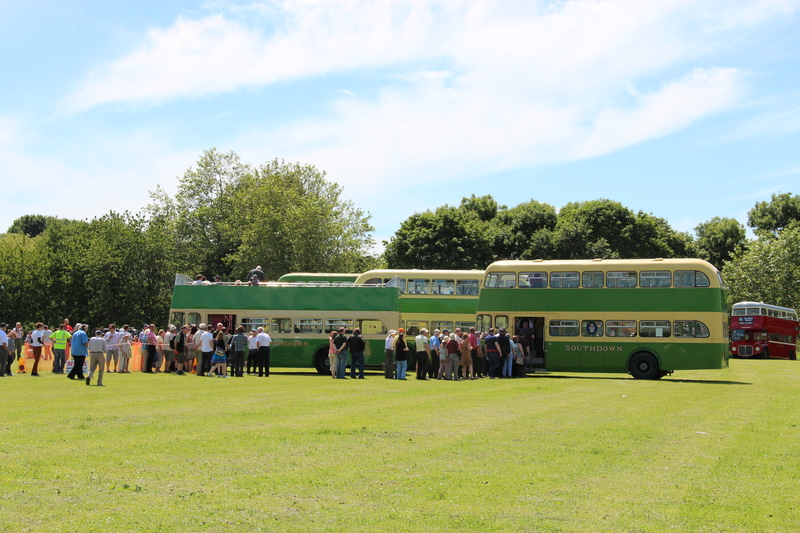 Sunday 1st June saw the first of our outdoor events and our first bus rally for 2014, although strictly speaking the Clacton Factory Outlet Village was a little way inland it was close enough to qualify as a seaside event. 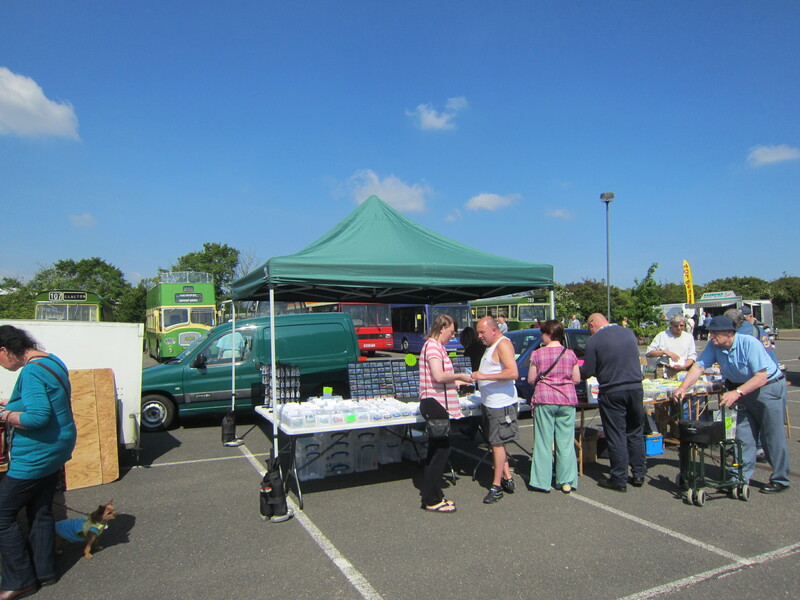 Having loaded the van with our stock and the gazebo we set off bright and early around 6.15, arriving at Clacton around 8.30. The display buses started arriving shortly after providing us with several worthy distractions while we were setting up. 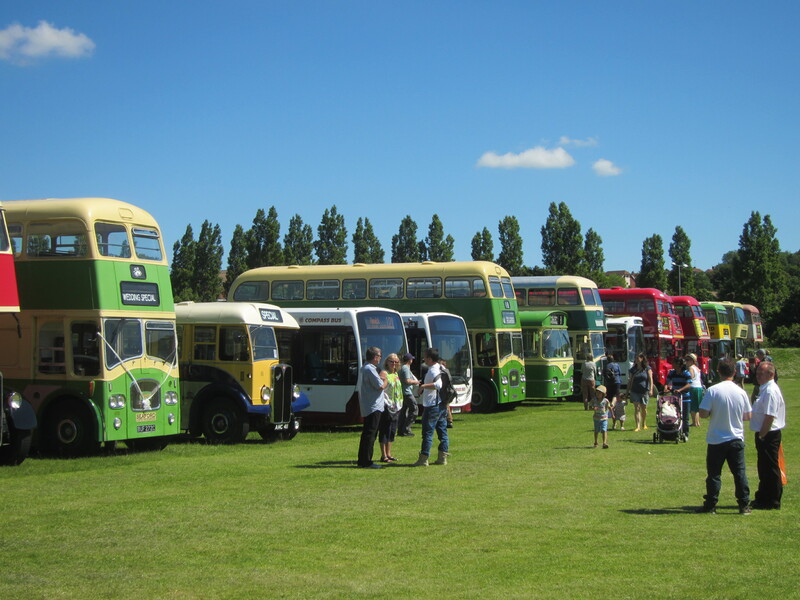 As is customary at events such as this, a number of these buses were available to give free rides throughout the day either into Clacton and along the seafront or to nearby Walton-On-The-Naze. For us part of the joy of these events is meeting young families on a day out. The children love to tell us all about an old bus they’ve just had a ride on and are thrilled when they see one of them featured our key rings or magnets and they can take it home as a souvenir. It is also a pleasure to meet and chat with the owners of the buses, they are generally impressed when they catch sight of their vehicle in our products. 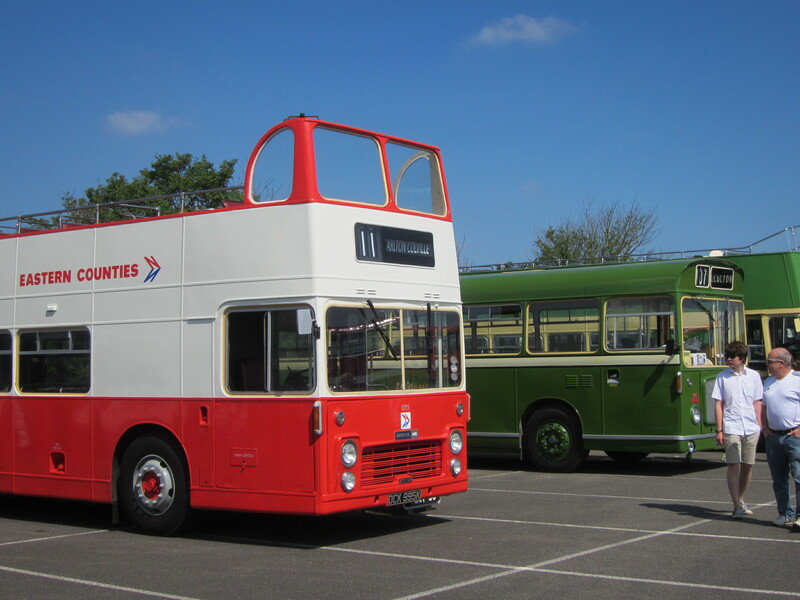 The old local bus operator Eastern National was well represented among the preserved vehicles in attendance along with it’s ‘red’ neighbour Eastern Counties (both in their THC, NBC and post deregulation days), while some splendidly restored vehicles from Westcliffe On Sea and Ipswich Corporation represented the local municipal fleets. 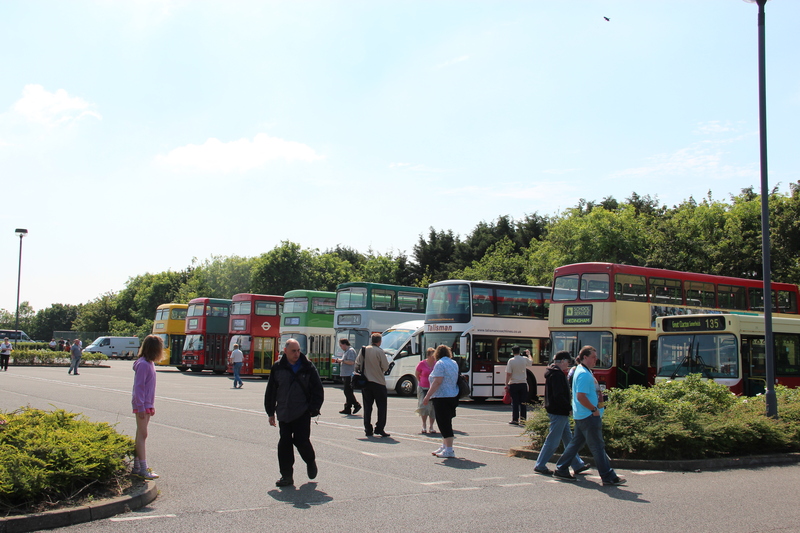 Vehicles from the current local operator, Headingham and District were also present along with some local coach operators. 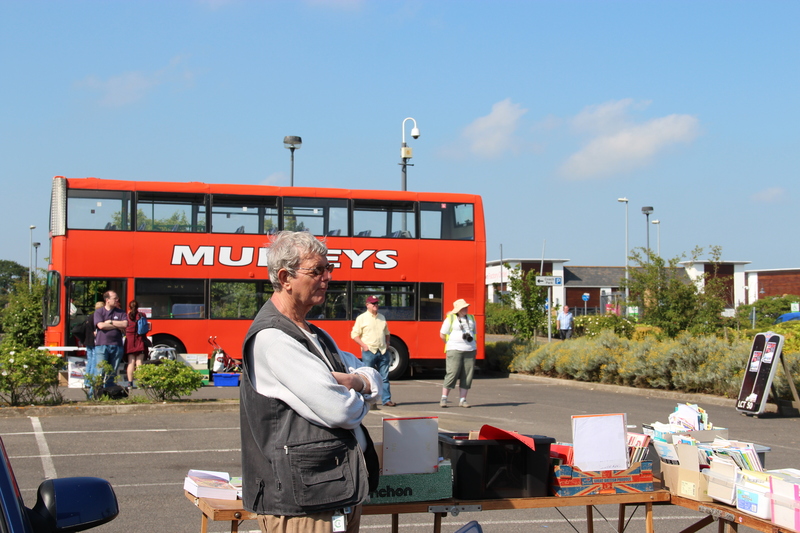 This was our first bus rally outside of our usual trading area, meeting new people and seeing a very different variety of vehicles made it a special day. Our thanks to the organisers.